MGM Senior Writer Glen Turk putting for birdie on the 18th hole at Sky Mountain GC. Lucky individuals have one friend that no matter how long time passes things pick back up like nothing has changed. 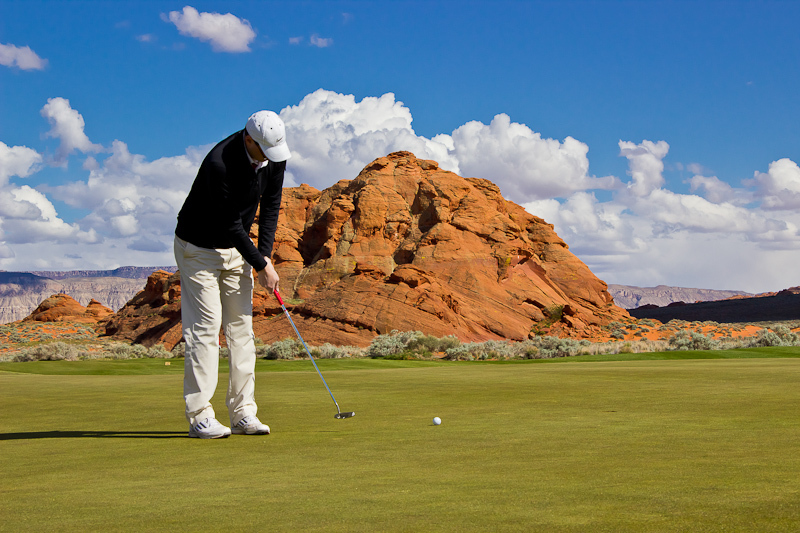 I not only have a person like that, but I also have a place – The Red Rock Golf Trail in Saint George, Utah. On March 28th of this year I renewed my friendship with the Trail after a three year absence that was 100% my fault. I will never downplay the phenomenal golf located west of the Mississippi in places such as Palm Springs, The Monterrey Peninsula, and Phoenix/Scottsdale, but if you want to experience a first-class golf destination without the pollution, people, and traffic, then St. George, Utah should be your next stop. St. George’s current population of roughly 100,000 has more than doubled in the past 10 years, but you would never know it thanks to an innovative infrastructure and the budding newness that permeates their wider than average downtown streets. Throw in the nearby remarkable Zion National Park (3.6 million visitors in 2015 alone), sunny skies over 350 days a year, and a refreshing civic pride and what you are left with is a city that borders on Utopia. For golfers who don’t like to drive hours between courses, The Red Rock Golf Trail is their utopia, as nine courses on the trail are within 10 square miles. This proximity definitely gives the trail a competitive advantage. “We are very fortunate to have so many courses so close on The Red Rock Golf Trail,” stated Joe Newman, who serves as the Marketing Specialist of the Trail as part of the St. George Convention & Tourism Office. “This makes it feasible for groups to play 36 in a day or simply have more time to relax after your morning round,” ended Newman. Our three day golf adventure commenced with a round at The Ledges, a Matt Dye links-style design with more twists and turns than a Spy Novel. Most links style courses aren’t afforded the luxury of being set inside a series of rocky cliffs and outcroppings, nor are they surrounded by an impressive housing community – The Ledges does both. What The Ledges also has is one of the best four-hole stretches in the west according to Director of Golf Steve Sargent. “Holes 12 through 15 are definitely our signature stretch of holes. The 11th green and the 12th hole in particular directly overlook Snow Canyon State Park which is spectacular. The 13th green plays downhill and slopes away from the player making it memorable if you two-putt! The 14th and 15th holes are perhaps our most photographed holes as the backdrop behind 14 offers an amazing view. And finally, number 15 is a short par-4 risk/reward hole with a separate island type green complex. This incredible stretch of holes is memorable to the player and definitely adds to the experience while playing The Ledges,” concluded Sargent. We then took on Sunbrook GC, which was twice rated Utah’s #1 course by Golf Digest. Before Sand Hollow Resort, it was the only course in southwestern Utah featuring 27 championship holes. The property is divided by three nines, the Pointe Nine, the Woodbridge Nine, and the Blackrock Nine. The Pointe Nine is defined by elevated tees and epic views, while the Woodbridge Nine is named after the 5th hole that featured a country-style wooden bridge. The Blackrock nine features three holes carved out of lava fields – an unexpected find on a golf course not in Hawaii! What I love most about Sunbrook is that it reminds me of the Midwest based upon its parkland setting. Sure, golfers will have views of the desert landscape from time to time, but honestly a blindfolded golfer might guess Wisconsin, Michigan, or Illinois before even coming close to Utah! Day two began with an incredible round at Sky Mountain GC, a city-owned and operated gem that is just far enough off the beaten path to be the most under rated course of the Red Rock Golf Trail in my humble opinion. The par-72, 6,383 yard layout borders the Virgin River and features three of the finest finishing holes the state has to offer. And here’s the best part – at no time during the year will you ever pay more than $65 per round at Sky Mountain. That’s municipal golf at its best! If you’ve ever experienced Sky Mountain, the first 15 holes are played in gleeful anticipation of holes 16 through 18. Head Golf Professional Kent Abegglen explains from there. “The red rock razorback hills, the virgin river gorge, and pine mountain range come together to form three spectacular golf holes. These are very well designed holes as accuracy is a premium. Number 17 is my favorite as the view of the canyon and mountains is amazing. The tee shot is very challenging but fair, but you must hit a solid tee shot. The second shot also has a premium on yardage control, the green has a false front and bunker right, good shots are justly rewarded,” said Abegglen. As you make the turn down a steeply graded, winding cart path between holes 11 and 12 at Sand Hollow Resort in Hurricane you will have a hallelujah moment. If you don’t, please consult your doctor to have your pulse and other vital signs checked. High above from the 12th tee box, the Virgin River bed will be revealed in all its glory set some 300 feet below cavernous cliffs and red rock outcroppings. If you can focus after viewing these omnipresent distractions, you will also see a series of four stunning golf holes that are begging to be conquered. With the edge of the world bordering the entire left side of this fearsome foursome, it’s a safe bet you will beg for an emergency back nine once your initial journey is complete. That description only begins to tell the story of Utah’s number one golf course, Sand Hollow Resort. Adam Jasperson, Sand Hollow’s Director of Golf, succinctly describes the property’s cache. “The Golf Course at Sand Hollow Resort is a destination. We have 27 holes of golf, 20+ acres of practice facilities, spectacular nightly lodging with course views, and a full service restaurant open for breakfast, lunch, and dinner. We host events, weddings, and offer private catering for groups from 4 to 160. Sand Hollow Resort is a must for any golfer, avid or novice,” explained Jasperson. Holes 19 through 27 at Sand Hollow consist of the amazing nine hole Links Course that intentionally mimics the origins of the game found on Scottish links layouts. You’ll be confronted with six foot high rock ledges that obscure fairways and form flowing, windswept doglegs throughout. And thanks to their 20 on-site hickory stick starter rental sets, honoring our golfing forefathers has never been so enjoyable or realistic. My walking round included the subtle din of a 1942 P-51 fighter flying overhead to complete the mirage of going back in time. In summation, if you don’t play the Links Nine during your stay you have not fully experienced Sand Hollow. Coral Canyon GC is 100% public, but elicits a country club feel based upon their superior amenities. The pro shop/restaurant is high class, while the driving range and putting green gave me the urge to practice more than my customary five minutes before teeing off. The par 72 layout is tucked within the Coral Canyon housing community, so million dollar views of million dollar homes are bountiful. Marco Leoni, Coral Canyon’s Head Golf Professional discusses why his course has been featured on every best in Utah list since the course’s beginning. “Keith Foster did a tremendous job when designing Coral Canyon Golf Course. It’s the type of golf course that any skill level golfer can enjoy a great round of golf. Our red rock transition areas and majestic mountain backdrops add amazing scenery to our beautiful course. The layout is different than any other course in the area with the variety of our design to prevent any feeling of playing repetitive holes. Our guests enjoy playing a different look and feel from hole to hole and from tee to green,” finished Leoni. And in a cool design anomaly, Coral Canyon starts out with back-to-back par 5s as a friendly way to get your round underway. Also, the inward boasts a trio of par-3s, 4s, and 5s taking full advantage of their land instead of playing follow the masses with a two-five-two routing of short, medium and long holes. MGM also recommends the only course on the trail not within St. George, Falcon Ridge in nearby Mesquite. For golfers flying into Las Vegas and driving 70 minutes northeast, a round at Falcon Ridge is the ideal way to begin your adventure. If flying into Vegas and doing the crowded rental car thing isn’t your style, MGM suggests flying United or Delta into the posh St. George airport with direct flights daily from Salt Lake City and Denver. With one indelible view and experience after another, St. George Utah and the Red Rock Golf Trail is a destination everyone should visit at least once in their lifetime. And if you’re anything like me you’ll be mad at yourself for waiting so long to get back! For more information on the entire Red Rock Golf Trail visit www.redrockgolftrail.com and for a list of their affordable stay and play packages log on to www.StGeorgeUtahGolf.com.